The Hon. 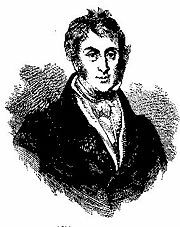 Mountstuart Elphinstone FRGS (October 6, 1779 – November 20, 1859) was a Scottish historian, a co-founder and Fellow of the Royal Geographical Society and a civil servant in India where he served as Governor of Bombay from 1819 until 1827. Previously, he served with distinction in the Maratha states as a British Resident. He was especially successful with intelligence gathering. From 1808 until 1811, he was envoy to the court of the king of Afghanistan where he accumulateed information on many aspects of Afghanistan's culture and politics, later writing an account of his travels and research. As Governor of Bombay, he took a particular interest in education, founding a College at Poona for the study of India's cultural and religious legacy. He believed that Western learning should be grafted onto India's heritage, not substituted for this. Elphinstone saw the British task in India as equipping Indians for self-government as soon as possible. This flew in the face of the dominant view, which was Indians would not be ready for self-governance for a very long time. In retirement, he turned down honors and offers of high office in order to write his History of India, largely to refute the work of James Mill's earlier history, which has been described as a sweeping condemnation of India and of Indians. Elphinstone, who had mastered several Indian languages as well as Farsi, drew on a wide range of Indian sources. Aspects of his work pioneered the modern study of Indian history, remaining relevant. Elphinstone is said to have loved India. His goal was to improve the welfare of the people; the aim of many of his peers was to advance their careers, earn as much money as they could and retire from India as soon as they could. Although, as an administrator, Elphinstone carried out the policy of annexation, he preferred indirect to direct rule, that is, the arrangement by which princely states remained largely self-governing. Elphinstone's legacy challenges racist assumptions by demonstrating that no single civilization can claim a monopoly of what is of value, interest and benefit to the flourishing of life. With several other administrator-scholars such as William Jones, Elphinstone helped to inspire Western interest in the study of India, significantly advancing understanding of important contributions to the cultural patrimony of the whole human family. Elphinstone is respected and admired by many Indians, who have little positive to say about the legacies of other colonial administrators. Mountstuart Elphinstone was born in Dumbarton, Dumbartonshire (now Dunbartonshire) in 1779, and educated at the Royal High School, Edinburgh, he was the fourth son of the 11th Baron Elphinstone in the peerage of Scotland and of Anne Elphinstone, daughter of Lord Ruthven. As the son of a peer, he was the "Honourable Mountstuart Elphinstone." His father was Governor of Edinburgh Castle and Elphinstone attended school in the Scottish capital followed by Sr. Thompson's School in London. His uncle, who was a director of the British East India Company secured an appointment for him in India where his brother, James was already serving. He reached India on February 26, 1796. His first appointment in India was to the ancient city of Varanasi where his brother was already stationed. His superior officer there, Samuel Davis, had taken advantage of the city's location to develop his interest in Indian literature and philosophy. Elphinstone soon interested himself in studying India's history, religions and culture and quickly learned Persian. He was also involved in intelligence gathering for the British and in early 1799 he became the target of an assassination attempt by the deposed nawab of Oudh, who succeeded in killing another British officer. After this, he was sent to the newly opened Fort William College, Calcutta where the company was now training its recruits and officers. At this time, the East India Company was beginning to develop what became distinctive branches of service, the fiscal, the legal and the political. The latter consisted of officers who were appointed to the Indian ruled states with which the British either had or hoped to have a treaty. In 1801, Elphinstone became assistant to the political agent in Poona, where the Maratha Empire's effective ruler, the Peshwa was based. Increasingly observant of everything he saw around him, Elphinstone recorded details of his journey in his diary, the beginning of many such accounts several of which he later published. The British plan was to place the Marathas under their protection as part of their expansionist policy. Some of the Maratha princes were open to an alliance with the British but several opposed this; they mobilized troops. The British governor, the future Duke of Wellington, Sir Arthur Wellesley, immediately moved against the Maratha threat. Although not a soldier, Elphinstone took part in the battle of Assaye September 23, 1803 as a member of the General's staff. He also took part in an attack on Gwalior, attracting praise from the Governor. However, it was already as a political agent that his services were valued, including his intelligence skills and by 1804 Elphinstone was resident at the court of the ruler of Berar, one of the defeated Maratha princes. Elphinstone found the posting congenial and continued to develop his understanding of Indian politics and to read works in Persian. Meanwhile, due to the Napoleonic Wars now waging in Europe, in which Wellesley himself would famously fight, suspicion that a possible French alliance with the kingdom of Afghanistan and other Indian rulers including Maharaja Ranjit Singh might threaten British India from the North East became a real concern. This led to the mission that sent Elphinstone to Afghanistan as one of the earliest British visitors to this mountainous region. Elphinstone's commission was to persuade Shah Shuja to ally himself with the British while another envoy attempted to persuade the Sikh Maharajah. On the one hand, Elphinstone did not succeed in negotiating a treaty because he was unable to agree to the terms stipulated by the king. On the other hand, Elphinstone took back with him to British India not only significant strategic information about political conditions including the important role played by Muslim leaders but also geographical data, even mapping out routes. He also collected information on diseases, agriculture, local trade and industry and accumulated written materials. His Account of the Kingdom of Caubul (1815) continued to be an important source of information for many decades. Elphinstone's knowledge of Maratha society and politics was too valuable for him to be long deployed elsewhere. By 1811, having written up the report of his mission to Shah Shuja, he returned to Maharashtra as Resident at Poona. The Maratha states were not formally annexed, remaining technically independent. However, the Residents were instructed to take control of all communication between the princes, on the basis that they were their chief advisers. Together with the high financial burden of paying the British for the support of troops garrisoned in their territory, this interference with the traditional modes of communication annoyed and alienated the princes. inevitable, as relations deteriorated, a Maratha revolt took place. Elphinstone had established a sophisticated intelligence network of espionage agents across the Maratha confederacy. Information provided by him proved crucial in the confrontation that followed. The Marathas were defeated in November 1817 and Elphinstone, who once again had conducted himself with distinction during the conflict, was empowered to bring the states under British authority. Elphinstone had actually developed an admiration for the Marathas and for their social and political system, especially for the self-governing villages. Personally he favored indirect not direct British rule and although annexation proceeded, he used his position to maintain as many local practices and offices as he could. He left Hindu temples and Muslim mosques in charge of their own revenue and some hereditary officials in post, such as village headmen (patels) and local tax officers, the mamlatdars. He did abolish the higher hereditary officers because he saw these as less accountable and possible as a potential threat to British power. Many princely states remained semi-independent until the end of the British Raj but the policy was to find any excuse to annex them. Often, princes were removed for alleged incompetency or profligacy; or, their heirs were not recognized for a variety of reasons and sovereignty defaulted to the British, or so they claimed. From 1817 to 1818, Elphinstone was posted to the Deccan to assist in establishing the British administration in newly conquered territories. In 1819 he was rewarded with the governorship of the Presidency of Bombay. Alongside the governorships of Bengal (which, them, was the most senior) and of Madras, this was one of the three most important posts. His tenure as governor of Bombay, which lasted until 1827, was marked by several significant developments. One of these was the opening of a College in Poona in 1821 for the study of Sanskrit, ancient Hindu literature and science. In a Minute on Education penned in 1824 he advocated the retention of Indian institutions, favoring the grafting of a Western curriculum onto traditional Indian learning. It would, he said, "preposterous" to 'add to the intellectual treasures of a nation" by setting out to destroy its "indigenous literature." This was more or less what official British policy was beginning to favor. Many considered that there was nothing of value in India's literary heritage, so they did not see any reason to preserve it or to spend good money on doing so. Later, government money on higher education would only be spent on teaching a Western curriculum. Elphinstone commissioned a survey of existing schools which concluded that the main problems were lack of books, shortage of trained teachers and of funds. His chief concern was "the welfare of the people" which places him in a different category of official than the majority of his peers, whose main interest was in the balance sheet of the East India Company. Elphinstone's ideas resemble those of Warren Hastings who had thought more in terms of a British-Indian partnership than of a guardian-ward, subject-object relationship of superior to inferior. kulkarni describes him as "a sagacious statesman who did not favor a wholesale importation of the Western system of education into this country." The latter became the dominant view; indeed it became more or less official policy after the First War of Indian Independence under the influence of John Stuart Mill who argued that Britain had a moral obligation to act as a ward for those people yet unable to govern themselves. Elphinstone wanted to equip Indians to assume responsibility for governance as soon as possible. For him, achieving this would "spell the fulfillment of British rule in India." Most British officials in India were very reluctant to allow Indian very much responsibility, suggesting that it would be a long, long time before they were ready to assume senior posts. Before retiring in 1827, he built the first bungalow in Malabar Hill, during his tenure as the Governor of Bombay, 1819 to 1827, and following him, many prominent people took residence here. Elphinstone College, the oldest component of what is now the University of Mumbai, was endowed in his honor. European residents erected a marble statue of him. The Elphinstone Road railway station and the Elphinstone Circle (now [[Horniman Circle Gardens}} were named after Lord John Elphinstone his nephew, who also became Governor of Bombay in 1850s. Although offered other senior posts, including the Governorship of North America, the Governor-Generalship of India (offered twice) as well as a baronetcy, he turned these down. He may well have decided that he wanted to spend his twilight years as a private scholar, especially to write a history of India that would challenge James Mill's 1817 work. He regarded this book as an attack on India's heritage. He disliked Mill's "sweeping condemnation of the Indians" and with Mill's assertion that cultures were static. Elphinstone believed that reforms were needed and that India could benefit from Western science but he did not want to replace what already existed. His History of India, unlike Mill's, drew on Indian sources and has been described as "an objectively favorable account of Indian life and culture" that inspired others to "write on Indian history" from a less prejudiced perspective. Despite his respect for Maratha systems he tended to stress "cultural achievements rather than political." It would be, however, the views expressed by James Mill and by his son that dominated; the idea that "Indians were un-fit for self-government" and an "arrogant tone characterized" much subsequent "British writing on India." On the other hand, his history was "immediately adopted" by the Indian Civil Service College. A lengthy period of travel followed. He visited Greece, Egypt, Italy, France and Turkey before returning to Britain in 1929. He took up residence in Albany, London. In addition to writing his history and other scholarly work, he was a founder of the Royal Geographical Society in 1830. He was elected a Fellow (FRGS) in 1852. In this, his career resembles that of Henry Thomas Colebrooke who also retired from India into a life of scholarship and became a co-founder of both the Royal Asiatic Society and of the Royal Astronomical Society. Elphinstone, whose legacy is generally assessed positively by Indian writers has been described as "deeply in love with India." Elphinstone remained a bachelor. He is said to have enjoyed friendships with Indian women while in India but not, unlike others, to have fathered any illegitimate children. He died in Surrey, England having taken a house there in 1847 on November 20, 1859 and was buried at Limpsfield. Elphinstone is said to have become a "devout Unitarian" and to have favored the Sermon on the Mount above all other Bible passages, possibly because he saw moral action as the highest good. This description appears to refer to his convictions rather than to any formal affiliation. He was raised a member of the Church of England. There is little doubt that he admired much of what he saw in India's religions, although he was less positive in what he wrote about Islam. He is said, though, to have loved the Persian poets, especially Hafez and to have favored "free-thought." in every respect an extraordinary man, possessing great activity of body and mind, remarkable talent for and application to public business, a love of literature, and a degree of almost universal information, such as I have met with in no other man similarly situated; and manners and conversation of the most amiable and interesting character. Had the attitudes and sympathies of an Elphinstone dominated British rule in India, a very different relationship might have developed possible resulting in a permanent partnership, in the granting of independence much earlier. This might have avoided the bloody Partition of India. Elphinstone was a product of colonialism. It was as a servant of empire that Elphinstone went to India. Yet, once there, he had the courage to dissent from some of the prevalent attitudes and policies and to develop a profound, respectful interest in everything he encountered. He did not agree that all that was of value and of permanent worth was to be found in Western civilization. He tended to agree with the opinion of those who thought that Indian civilization had declined over time, that what was most valuable was from the classic age. However, he also believed that Indians were capable of change and that this could occur much more rapidly than Mill and others thought possible. Elphinstone cannot be completely exonerated from an attitude of paternalism yet he was much more in tune with Indian life than were most of his peers. Few of them loved India. Most tolerated living in India because of the rewards of office—Indian civil servants were highly paid - but many learned little about India or Indians, living apart in cantonments and only learning enough of the vernacular to fulfill their duties. hardly conceive that this was the individual whose writings were of the highest historical interest, whose political services were pre-eminently momentous, whose guidance in war and administration in peace furnished models of penetration, bravery, intelligence and wisdom and produced resulted of incalculable importance to the British Empire. His entry in the Dictionary of National Biography describes him as "one of the chief architects of empire." Sir Thomas Edward Colebrooke, son of Henry Thomas Colebrooke, write his Life in 1884. Other biographies include Cotton (1896) and on his Indian years, Choksey (1971). A statue of him was erected in St Paul's Cathedral. Henry George Keen, his DNB biographer, who wrote extensively on Indian literature and history, considered himself a disciple of Elphinstone. ↑ Elphinstone and Forrest 1884, 110. ↑ 7.0 7.1 Sreedharan 2004, 408. ↑ Indian Council of Historical Research. 1974. The Indian historical review. (Delhi, IN: Vikas Pub. House), 191. ↑ Royal Geographical Society (Great Britain). 1879. Proceedings of the Royal Geographical Society and monthly record of geography. (London, UK: Edward Stanford), 124. ↑ Royal Geographical Society (Great Britain). 1879. pages 125-126. Bishop Heber was the first Anglican bishop of Calcutta. ↑ William Jerdan, 1866. Men I have known. (London, UK: G. Routledge and sons), 189. Choksey, R.D. 1971. Mountstuart Elphinstone: The Indian Years, 1796-1827. Bombay, IN: Popular Prakashan. Colebrooke, T.E. 1884. Life of the Honourable Mountstuart Elphinstone. London, UK: J. Murray. Cotton, James Sutherland. 1896. Elphinstone, and the making of southwestern India. Oxford, UK: Clarendon Press. Retrieved February 25, 2009. Elphinstone, Mountstuart, and Alfred Janata. 1969. An Account of the Kingdom of Cabul and its Dependencies in Persia, Tartary, and India. Graz, AT: Akademische Druck-u Verlagsanstalt. Elphinstone, Mountstuart, and George Forrest. 1884. Selections from the minutes and other official writings of the Honourable Mountstuart Elphinstone, governor of Bombay. With an introductory memoir. London, UK: R. Bentley and son. Retrieved February 25, 2009. Elphinstone, Mountstuart. 2002. History of India. New Delhi, IN: Atlantic. ISBN 9788171562824. Hampton, Henry Verner. 1970. Biographical studies in modern Indian education. Biography index reprint series. Freeport, NY: Books for Libraries Press. ISBN 9780836980424. Keene, George Henry. 1908. "Elphinstone, Mountstuart." in Dictionary of National Biography. Volume VI. (Oxford, UK: Oxford University Press), 744-746. Kulkarni, V.B. 1972. Problems of Indian democracy. Bombay, IN: Bharatiya Vidya Bhavan. Kumar, R. 2004. Western India in the nineteenth century. Routledge library editions. London, UK: Routledge. ISBN 9780415330480. Mason, Philip. 1987. The Men Who Ruled India. London, UK: Pan Books in association with Jonathan Cape. ISBN 9780330296212. Mill, James, and H.H. Wilson. 2003. The History of British India, vol I. New York, NY: Barnes & Noble World Digital Library. ISBN 9780594085836. Scholberg, Henry. 1998. The Biographical Dictionary of Greater India. New Delhi, IN: Promilla & Co. ISBN 9788185002231. Sreedharan, E. 2004. A Textbook of Historiography, 500 B.C.E. to A.D. 2000. New Delhi, IN: Orient Longman. ISBN 9788125026570. Indian History Sourcebook: Mountstuart Elphinstone: Indian Customs and Manners, 1840. Elphinstone's books at the Internet Archive. This page was last modified on 25 October 2018, at 20:55.